You can sort of see that the headstock on the left is a little smaller than the one on the right. Look at the truss cover-it is closer to the diamond inlay and closer to the nut on the one on the left. I know, the perspective is making it look greater than it is but that’s the photo I have. As it turns out, the one on the left has a stinger and, as I showed you in the “Stinger Things” post, that stinger covers a veneer that covers a set of tuner holes that were spaced for a 335 or 345. 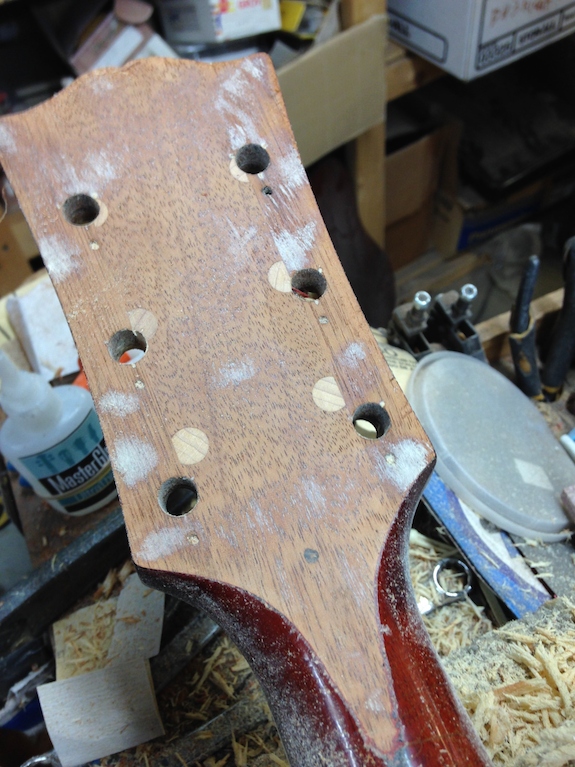 Since the front of the headstock gets a different overlay and inlays, you don’t see the old tuner holes on the front. In order to cover them on the back, the veneer was placed there. To cover the veneer, they just painted on a stinger. But wait, the 355 headstock is a good bit wider than a 335 or 345 headstock. Easy fix. A 335 and 345 headstock is really three pieces-the middle piece is the neck itself but there are two wings on either side that give the headstock its width and shape. So, to make a 355 headstock, knock off the 335 wings and add a bigger set of 355 wings. The one thing they couldn’t change was the length of the headstock when converting a 335/345 to a 355. Thus, the discrepancy in headstock length on the two 59’s. 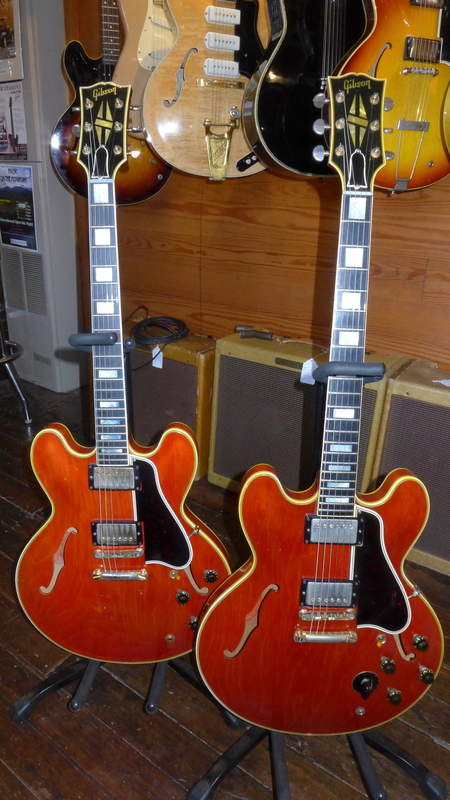 I’ve seen it in 1960 as well but since I don’t see as many 61-64 ES-355’s, I’ve never measured a stinger version vs a non stinger on an example from those years. Feel free to help me out. What’s all this then? What they did here was to take a 335 neck-already drilled and ready to go and cut the smaller wings off the sides and put big 355 wings on it. Then the doweled the holes and re-drilled them located for a 355. Then they put a piece of mahogany veneer over it and painted on the stinger. The only tuner holes you see are the original Grover holes. Definitely factory but definitely a little shorter than the usual 355 headstock. Mystery solved. Obscure topic but certainly fun for us ES git-nuts! Along the same lines and similarly interesting, years ago I encountered a ‘59 355 Stereo with a veneer on the back of the headstock. Hmmm, I said to myself, this couldn’t be stock Gibson. Must be an aftermarket repair. Was so convinced until I saw another ‘59 355 years later with the identical veneer! Never say never with these quirky old Gibsons folks! 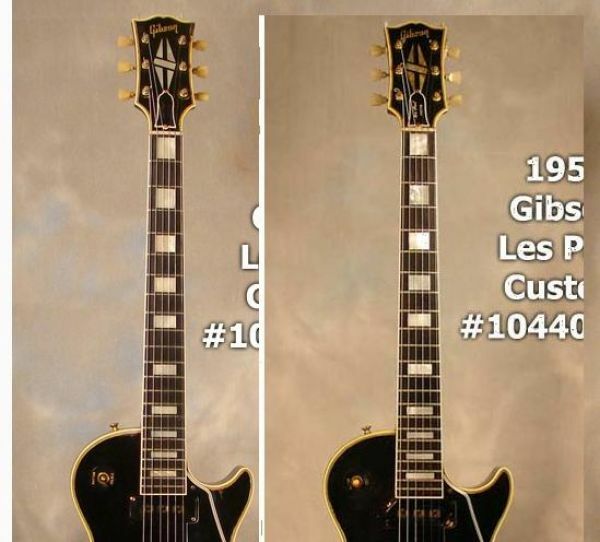 Looking at Charlie’s above photo, interesting how Gibson used maple instead of mahogany plugs to fill the 335 shaft holes. The 355 I mention above had the back of headstock veneer but no stinger so the veneer contours were fully visible under the luscious cherry red lacquer! The plugs are maple because they are made from maple dowels, which are readily available in the necessary diameter. It’s all about getting the job done quickly and as cheaply as possible. Mahogany veneer (something they would have on hand anyway) covers all the evidence….providing they take the time to paint that stinger on there! 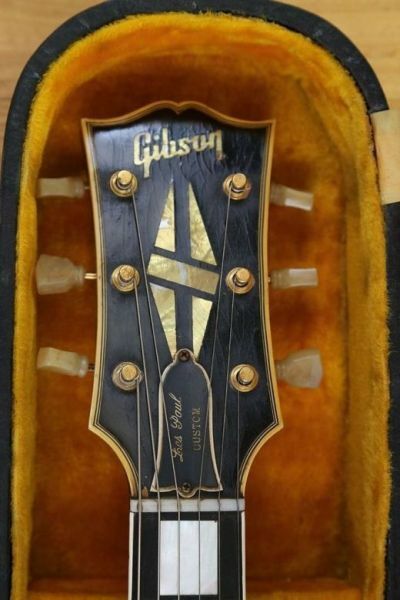 Seems odd that Gibson would go through the trouble converting the headstocks when they had the template for the larger Custom stlye head.Unless the neck was already glued on the body.Anyway,Hears a couple pics of the different LP Custom heads.Seems the short neck ones were only on ’53s with no serial number.Probably “first rack”. Anyone else want to hear Charlie opine on wonky tuner alignment? !